In industrial automation, the combinations of control, signal and power cores are now commonly been used. 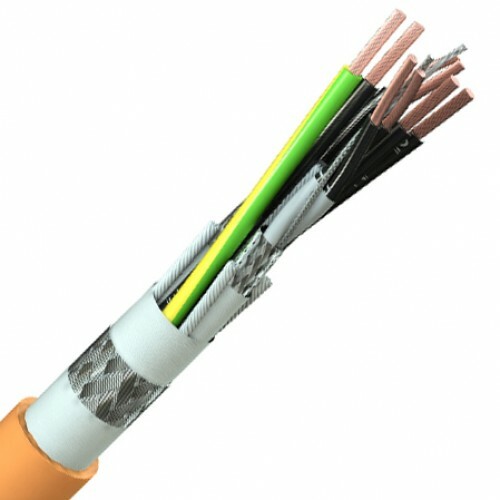 Fine copper wire strands with high performance insulation and sheathing material make them ideal for regular flexing applications. A wide variety of core combinations are manufactured as standard. Power cores: very fine copper wire strands, polyolefin insulation with cores 1-3 black with white numbers, the fourth core is a green/yellow earth. Control cores: very fine copper wire strands, black TPE insulation with white numbers. Aluminium/polyester foil with a tinned copper braid screen, around each pair there is a polyester foil wrap. Power & signal cores are twisted together with very short lay lengths. Synthetic fleece with overall tinned copper wire braid, low friction polyurethane sheath.